The ultimate car travel charger for road trips, vacations, outdoors, emergency kits and more; Few products come close for sheer on-the-go versatility. Easy to use, simply plug the 300W inverter straight into the vehicle's cigarette lighter. Enjoy 2 USB ports (4.8A) and 2 standard plug outlets (e.g. for laptops) for convenient charging on the road. 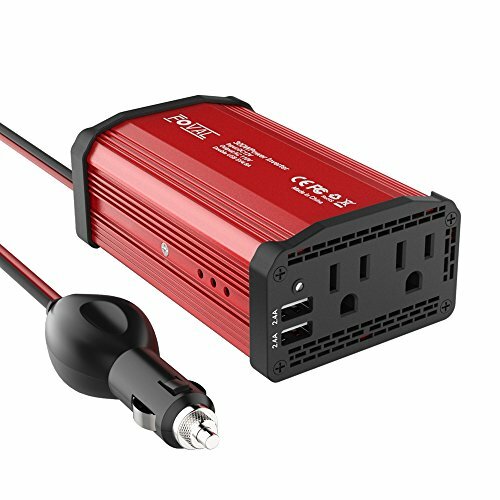 Ultimate Versatility It can be used for camping, outdoors, vacations, road trips, remote job sites, and even charging household items. Dual USB ports effortlessly charge two devices (including any smart phones and tablets) at once while the outlets can power a wide range of power-hungry items on the road. For maximum utility, stay in charge at all times and add this to your travel emergency kit. If you have any questions about this product by FOVAL, contact us by completing and submitting the form below. If you are looking for a specif part number, please include it with your message.